Always love a good contemporary. I haven't read anything by Lisa Schroeder. I've always meant to. I love contemporary and can't wait for this one! It's weird because like even a year ago I wasn't reading like any contemporary and now it's like I must read them all!!! I can't wait for this one either. Love Lisa's books! Great pick! I love contemporary romance but haven't heard of this author. The Bridge from Me to You sounds good though :) Nice pick! 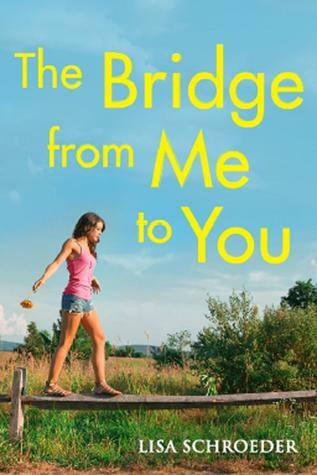 This one comes out soon and it's also on my TBR list :) Thanks for sharing! I have read Chasing Brooklyn by Lisa Schroeder and since I absolutely loved that one, I am really looking for to this one. I haven't read anything by Lisa Schroeder either. I've recently been reading some really good contemporaries, and this sounds awesome. Great pick! This sounds kind of sweet! Maybe a bit of drama/angst thrown in for good measure? I love contemporaries too. I already have this one on my tbr. I hope we both enjoy it. Great choice! I don't read contemporaries very often but this one does sound pretty good. I've heard great things about Lisa Schroeder's other novels as well. I don't think I've read anything by Lisa Schroeder, but I've heard good things! If I remember correctly, I think one perspective is written in prose, and the other in verse? Another book I must add to my list! !